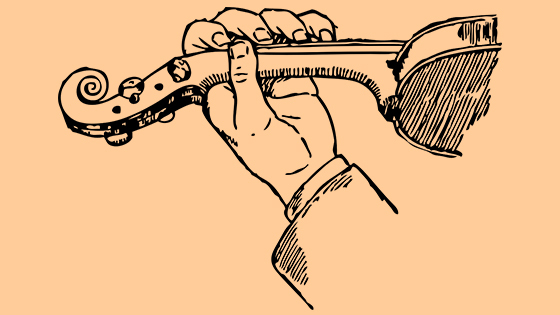 October 18, 2018, 7:31 PM · When it comes to the left-hand of a violinist, three things can go wrong: the fourth finger won’t reach far enough, the wrist becomes immobile, and the hand and the arm doesn’t adjust for plane changing that takes place on the fingerboard. For those of us who lacked the skills to play football or other “big motion” sports, we were lucky enough to inherit the micro-movement talents that our instruments require. In the pages of Violinist.com, we celebrate the tiny radii of string changing and shape shifting that small spaces demand of our left hands. The mere thought of angles and eency-weency distances can frighten off players at all levels. The good news is that maneuvering around the fingerboard can be integrated naturally into our playing, without complex explanations. Our left hands find their way around the fingerboard the same way we handle another complicated motion, turning a door knob. When our minds grasp the over-all movement, our hands follow suit. Nothing short of miraculous, this ease of transferring from the mind to the movement is a gift we cherish. Not everything will work the way we want it, though, but we should be thankful for the talent that gets us to a certain point. So how do we get our left-hand technique to function as easily as turning a door knob? My elementary school conductor/violin teacher Billye Cook taught us an exercise called “The Rhythmic High Jump.” With your finger on any string in first position, you would count 1-2, and on 3 you would spontaneously switch to a different string and a different finger. The purpose of the exercise was to keep the hand in its proper, round shape, and to avoid its tendency to collapse into the top or bottom of the neck. Keeping the hand high and round like a mountain was a priority. She told us that if we hesitated during the change of string, the hand would become lazy and just droop. Like a Salvador Dali kind of blob, my hand would collapse on the E string side. My third finger would perform in an ungainly and grotesque manner because I hadn’t positioned my hand properly. She called this setup the scaffolding process, in which the hand first needed to morph into its new shape and on to the new string. Then the finger is ready to drop easily into the proper slot. This is not unlike bowling pins being lowered onto their proper position. The quick, rhythmic change of string felt like a jolt after all the hesitancy I used to give in to. At first, the fast motion felt like a twitch, but eventually my fingers moved rhythmically and didn’t lose their round form. Surprisingly, I got better at counting because it was connected to the job of moving my fingers. The counting was no longer abstract; it had context. While all of us walk by moving first our torsos and our feet in the correct sequence, some of us move our fingers before the hand has positioned itself on the new string. If this isn’t your problem, be grateful for having been born with that talent. The key to fixing such an impediment is to not give in to the reflex that causes your hand to collapse and warp. At the moment just before the hand makes its move, pre-plan what the finger and hand are going to do. You will have pre-empted the cursed “bad reflex” and can then replace it with a better one. In a violinist’s miniature universe, even adjacent fingers needed two different scaffolds. Ms. Cook’s exercise gave my hand an alertness that prevented lazy collapse. By teaching us to move fingers in a strong rhythm, she helped us develop a flexible AND structurally sound hand position. “You have more time than you think!” Ms. Cook used to say when we were practicing the exercise. Sure I felt rushed, but she advised us not to think merely from note to note. She taught us how to expand our thinking to cover a group of notes. When I grew up I realized she had taught us about the difference between observing and intellectual thinking. How she was able to convey this to a group of sixth graders was amazing. I have a feeling she learned these ideas the hard way, in order to solve the same obstacles that had plagued her own playing. October 19, 2018 at 01:42 PM · Do you have any videos of the left hand exercise you mention here? October 20, 2018 at 11:33 PM · I love this exercise! Easy to remember and I'm optimistic it will produce results. Your article is well-written, funny, and helpful. Everything one would want in a blog post. Thank you! October 21, 2018 at 03:20 AM · To 51, Thank you and I hope the exercise strengthens your left hand. I tried to convey the importance of rhythm in moving your fingers and hand. I wish we started out on the violin with a more stable and reliable instrument, but it moves left and right and up and down when we move the bow. I guess if I wanted a more solid structure I would have picked the piano or the xylophone. Craig, there is no video. However, if you practice the exercise in the mirror, it will be more apparent where any weaknesses are. October 21, 2018 at 04:10 PM · Like Craig, I think it would be helpful to have more than a couple sentences that describe the actual exercise. There are still numbers of questions: Do you stay in first position? Do you include shifts? Do you determine where you are going prior to the count? Did you teacher write these out first or tell you what two notes you would jump between? Do you repeat the same jump several times or change every time? Is it an improvisitory jump from any note to any other note? Maybe you think this is clear in your writing but it comes across more vague than you might think. October 21, 2018 at 05:29 PM · To 16, Thank you for your comment and questions. This exercise can be used by violinists whether they are beginners or advanced. There is no one way to practice it. Instead it encourages the player to pick any two notes, on any strings, and between any positions. The purpose is to have the student coordinate her rhythm with her left hand movements, a skill that should not be taken for granted. The other purpose is to teach the student how to think and strategize between beats. Time limits is both a scourge and a blessing for violinists. It makes us think more clearly and coordinate several activities more efficiently. How one goes about this exercise is left up to the individual.